I was going to write something about "Fantastic Beasts and Where To Find Them" - which we saw twice, once the weekend before Thanksgiving and again on Thanksgiving Day - but I can't figure out what to say past "I liked it a lot and so did Rob." This may have more to do with my state of body/mind right now - I feel kinda like crap, honestly - than with anything having to do with the movie. Obviously I'm going to have to come back to that topic later. Man, I hope I'm not getting sick. Well, here, I'll throw you a couple of random holiday-related pictures. I found a paper-chain kit at Target last week, in the $1 section, so I bought three of them. They came color-themed so I bought one of each in red, green, and gold, and I alternated them when I put them together. 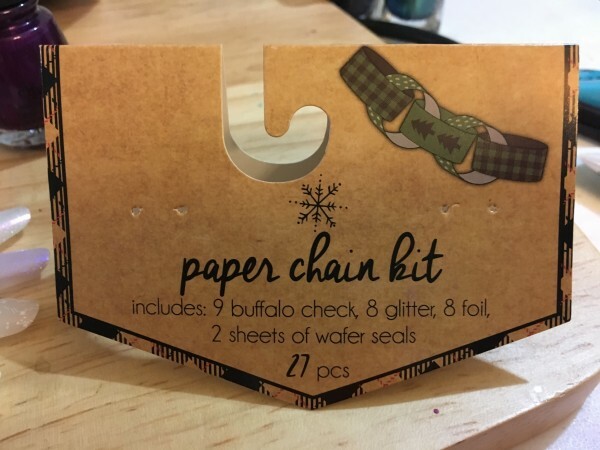 It's not something it ever occurred to me that I needed a kit for before, but now that I have paper-chains draped all across the living room, I think they're pretty brilliant. It was just pre-cut strips of paper and some stickers to hold them together with. I just taped it up and so far it's holding fine. I think it's kind of awesome, really. Thus far the only outside decoration I've put up is my big silver wreath on the balcony door. I'm sure I'll get around to doing some more of that later. Gawd, look how organized I was with the holiday stuff in 2007 - the nutcrackers lined up on the china cabinet and all! I was very unusually organized that year, generally, which not coincidentally was the same year my mother died - we had moved right before that and we were dealing with the estate stuff, too, so I had had to be. I guess you have to know me to know how unusual that is. I went to a Stampin' Up class - well, actually I've been going to them off & on all year. (Sort of a disclaimer here: while their classes do use primarily their own products, the ones I go to don't push you to buy anything at all. I do think that their products are very, very good quality and I've ended up buying quite a lot of stuff from them lately, but I really love that they don't try to force them on you, and I'm not trying to sell you anything either! I'm just showing you what we've been doing.) The usual thing that we do in these classes is make maybe 4 or 5 different cards - for various occasions, depending on the season and such - and sometimes a novelty sort of item like a card holder or a candy holder or something like that, and the price of the class includes all the supplies to make all these items. What we did in December was make whole bag full of cards instead - it did cost a little more to make up for the extra supply cost, but it was still pretty reasonable. I think it was 5 each of 4 different cards that we made, or maybe it was 4 each of 5 - I guess when I look at the pictures again I'll figure out which one it was! Both of these used what SU calls "builder punches" - one punch that punches out several different related items. For the stocking it is the stocking body, plus the cuff, heel & toe pieces. And there's also a coordinating stamp set. (SU is very big on coordinating stamps and punches, as a matter of fact.) The other one is a pennant set - imagine several of the little triangular tree pieces turned upside down and strung on a cord, then it becomes one of those pennant garlands that have been so popular the last couple of years, right? Whoever designs all this stuff was very clever and anticipated this double use - you can tell because of (a) the tree design that's stamped on it, and (b) and maybe (c): the little brown pot the tree is sitting in, all of which was in the same stamp set, and I think that the star on top may have been, too. Anyway, I thought both of these were very cute. 1) is probably the simplest: vellum run though an embosser with a snowflake pattern, and glued down - which is the tricky part, with vellum, because if you use the wrong kind of adhesive, it shows through. I think we put glue dots under the spots where the rhinestones were, and we hid some more under the ribbon. We used different colors of cardstock - I got home with red and green - and they all looked beautiful, although I think the red ones are my favorite. 2) was a technique that the demonstrator Sue had seen somewhere I think - you use baby wipes to make a sort of ad hoc stamp pad. SU sells little reinker bottles for all their stamp colors, so she dripped ink in stripes onto the stack of wipes, and made it large enough to cover this medallion stamp, which is a large one, I would say it's 5 or 6" in diameter, at a guess**. And then the black sentiment is embossed to make it stand out. I really like this technique a lot. I'm trying to persuade myself that I don't need to have this stamp to go with it! 4) was probably my very favorite. It was supposed to have green ribbon on it like the vellum ones have, and I kept forgetting the ribbon, and then I decided it didn't need the ribbon at all. The glitter is something called (I think) Diamond Dust, and it was really really pretty and it also got all over everything. And I mean everything. 5) had mica flakes substituting for snow, which was weird but it came out pretty cute. These were also pretty fussy to make. ** It occurred to me later that this couldn't possibly be correct, because the card is only something like 5-1/2" wide. (Because they're normally made out of half of an 8-1/2x11" sheet.) So that stamp must be more like 4 or 4-1/2" - still big, but not THAT big. This might end up being a two-parter, because apparently I took a lot of pictures of cards. This is what I mean by "the style I've learned in cardmaking class" - lots of layers. It does come out very well. These are stamps from a big set of clear stamps I had, and the printed paper is just some out of a package that I bought at the craft store, I think. The trick here (learned after a couple of failed experments) is that the cardstock you make the base card out of has to be thick enough to bear the weight of the layers. The ones on these cards are in fact not very heavy, but some I've done are. I was experimenting with inks, too - the lighter green is Stampin' Up dye ink (in Wild Wasabi, if you want to know) and the darker one is a pigment ink that I already had (color was something like Evergreen). I like both of them but they do give you very different effects. The music staves here are all the same rolling stamp from Stampin' Up - I bought a couple of them. (The other one is trees.) And I didn't know what the felt snowflakes might possibly be good for when I bought them, but they turned out to be very useful! I think I used the same "Happy holidays" stamp on the inside of this card that was on the tag above, to carry through with the snowflake theme. Hey, cool, look, glitchmas trees! It appears that my problem there is that I hoard craft supplies, and I keep changing crafts, so I have tons of supplies for several different ones, and only a small apartment to put it all in. When we first moved back into an apartment with two bedrooms a few years ago, I thought that that would fix the issue - the 2nd bedroom would be the craft (and storage) room! but it didn't work there and it's not working here either. In both apartments the dining area got annexed very quickly. The quilting stuff has stayed in the bedroom because I'm not actively working on that, but the jewelry and then the papercrafting stuff ran all over. I guess I'm doing good to keep it mostly to those two areas, and consider that I'm doing well not to let it take over the whole house! Part of the reason the papercrafting supplies are running wild is because I bought a Stampin' Up demonstrator kit. It really is a good deal. (I got the deal that had a free Big Shot with it - which is a die-cutting and embossing machine - and that deal is over, but I think I saw that they were having another special on them - $125. The normal price is $175. So if anybody else wants to join in this craziness let me know! It's supposed to be over $300 worth of stuff, and you can substitute items, which I did like crazy.) So I have - let's see - four or five new stamp sets, as well as one single stamp and one rolling stamp - which I haven't actually figured out how to make work yet - and four new colors of ink pads, and a big pad of designer paper, which the SU devotees refer to as "DSP", constantly confusing everybody else. Aaand, um, a bunch more odds and ends that I can't remember now. Card stock and various adhesives and envelopes and a couple of different kinds of stamp-cleaners, although I have always cleaned my stamps with baby-wipes and it seems to work just fine.